It's nice to be out of that frozen world, and away from the clutches of Agar. Gotta make haste to the town in this creepy cavern. Go right. Kill that approaching eyeball monster. Climb the vine to the top and move to the right. Keep running till you reach the door which reads 'Tumba' and go through it. Chat with the people and sage. You will learn quite some information. First of all you will need the Pirika shoes (again made by our friendly town-travelling shoemaker, Percel) to get across that life-sucking gelroid. Second, the shoes will be found in some chest, which will be pretty hard to locate! 3rd of all, don't get into the Encounter Zone, without a good old Knight's Sword. So why don't you go to the Weapons Master and try to buy one. Well I'll tell you one thing, he sure ain't good at lying! So now, you'll need to find a Crest of Glory so you can get the Knight's Sword from him. Boy! That sure is a lot of work. So let's get on with it! Leave the town from the west(left) exit. First of all we will go on a small journey to find a key. If you already have the key, then continue from here. Go left killing the spider and crossing the loose ground without falling down. Then climb the vine to the top and jump off to the right. Kill that spider and continue going right. Do not go through the door. Keep going right and you will be able to go through the one-way wall. A women in the town told you about these walls. Kill that large-white-eyeball and jump over those seemingly industructible red slime monstors. Right now, you can only kill them with Feugo or Lanzar. Your sword just seems to multiply them. Perhaps the Knight's Sword could help to kill them. But that all is for later. After jumping over the red slime monster, go through the blue door. Now go right and fall down. Proceed left, kiling the spider and climb down the wall. Beware of the huge eyeball. Fall right on the second ledge. Kill that zombie. A Chest! Will this be the one containing the Pirika Shoes? Open it. Darn. Only some 50 gold. Okay, go left and climb down the vine. Proceed left and wait at the chasm. Let that red slime monster fall down first. Then jump across. Whatever you do, do not fall down. You will have one hell of a difficult time to get out of that pit. Just jump across it. Then jump two times to reach the top of the hill and jump onto the moving platform. From the platform, climb the vine to the top and go left. You got the key! Time to return to town. Go left and move the lift down. Do not try to crush the red slime monster, you will only reproduce it. Jump across the red monster and climb the vine to the top. Wait for the red monster to fall down and then go left. Jump onto the hill. Then jump up to catch hold of the vine. When the moving platform is beneath you, let go of the vine and take a ride. When you reach the longer vine, catch hold of it and climb to the top. Keep going to the right until you reach a purple door and go through it. First of all eradicate that spider which is advancing towards you. Then go left and fall down. Move left, across the false ground, and enter the safety of your town. First of all repair your shield. You can also try and 'See your Power' and see if it can be increased. The almas rate here is pretty lousy. You'll be needing lots of money to buy the sword in the next level, so I would advise you to 'Record Your Experience' and keep your almas with you. I'll tell you when you should exchange them for gold. You can, however, deposit the money that you are currently carrying. Okay it's time to find the Pirika shoes. Leave the town from the west (left) exit. Go left killing the spider and across the loose ground. Then climb the vine to the bottom avoiding any pesky large eyeball monsters. Keep going left. To kill the zombie, jump and thrust your sword into his head. Then go through the one-way wall ahead. Kill the spider and climb down carefully. There are lots of monsters below, including some spiders which might attack you while you are on the vine. After dealing with all the monster, go right and jump across the vine. You should land on a lift. Move the lift to the height indicated in the picture below and go through the one-way wall. Now climb that vine and jump off to the right. Keep going right, kiling the spider, until you reach the end of the ledge. Then, hitch a ride on the moving platform and form that platform just simply walk onto the second moving platform. From the second moving platform jump onto the ledge. You have to do all this in one try or you will fall down and have to do it over again. Once on the other side, you see a Chest! Will this be the one containing the Pirika Shoes? Open it. Darn. Only some 500 gold. Okay, now climb that vine, go left, eliminate that spider who is waiting to greet you. Then enter the green door. Once you enter the cavern, a huge eyeball will attack you. Quickly destroy it. Then move to the left. Kill the zombie and climb the vine. Go left. A huge eyeball monster will greet you. Then when you approach the vine, 2 spider will give you his welcome message. After sending these creatures to hell, climb the vine and get off to the left. 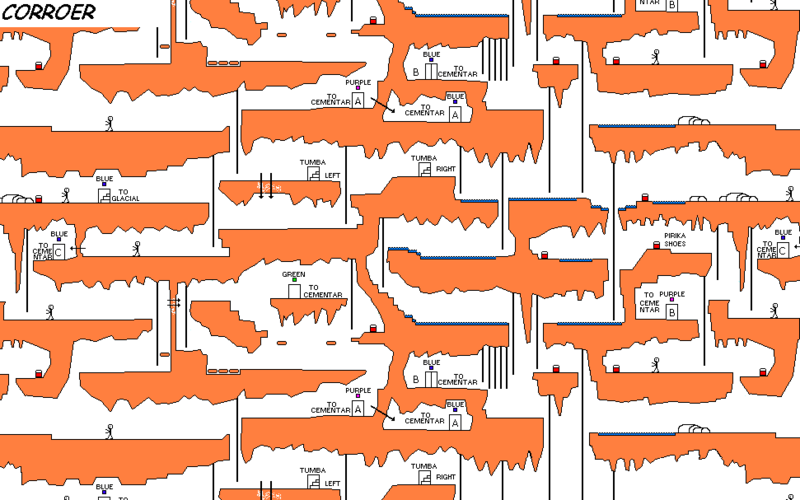 Then jump across the chasm and then jump across the second chasm too. Then hitch a ride on the moving platform to the other side. From there, climb down the vine. A spider will be waiting for you ahead. After finishing him, climb down the vine. A Chest! Will this be the one containing the Pirika Shoes? Open it. Darn. Only some potion. Okay, continue downwards. Another Chest! But alas! It is inaccessible. So go through the purple door. Go right and climb down the vine and go left. Kill the zombie. Keep going left. A Chest! Will this be the one containing the Pirika Shoes? Open it. Darn. Only some 50 gold. Okay, go right and jump across the chasm and keep going right. A Chest! Will this be the one containing the Pirika Shoes? Open it. Darn. Only some potion. Okay, now go back to the vine and climb it to the top. Beware of the eyeball monster which may fall on you from the top. Get off to the right. You may kill the sitting-duck zombie, but DON'T take it's almas! If you do that then you won't be able to come back up and have to repeat the entire procedure. Ok, climb the vine and get off to the left. Keep going left. What? Another Chest? Let's see what it contains. Open it. Omigosh! You'll have to go to Italy to find another pair like this! Take the Pirika shoes and wear them! Time to test if these things actually work. Jump over the slope. You have now officially entered Gelroid City. If you're low on health. Then climb the vine in front of you and get off to the first left. Jump over the red monster and splash into the Gelroid. Yup, that's right. It ain't sucking the life out of you no more. Go across the Gelroid and open the chest revealing a potion. Other wise you can just climb down the vine and have a swim in the Gelroid. These Pirika shoes will not only protect you from Gelroid, but from thorns, fire and other substances in the previous and future levels. 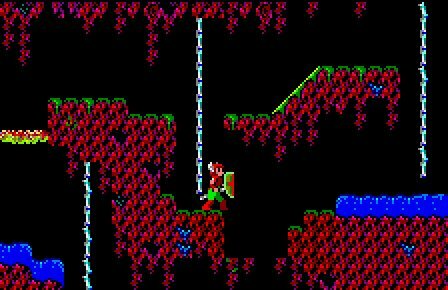 Jump across the red slime monster. Kill the spider and climb down the vine. Open the chest and get your prize for finding the Pirika shoes, 500 Gold. Then climb the vine in front of you, to the very bottom. Go right and jump across the chasm. Open the chest up ahead and get your 100 Gold. Now, you can return to town. Go back across the chasm. Keep going left, avoiding the red slime monster, at the same time controlling spider-population boom. Jump across the second chasm. Keep going left. Jump out of the Gelroid, climb the vine and go left, entering the town. First of all repair your shield. Then go to the bank and deposit your money. Don't exchange your almas just as yet (well, you might if you want to, but you won't get your almas's worth here). Finally go to the Sage, to 'See Your Power' and also to 'Record your Experience'. Also chat with the people. They will have something new to say to you, since you have found the famous Pirika shoes. Okay, you just have one more unfinished business left. That is getting the Knight's Sword. So let's get on with it! Leave the town from the east (right) exit. Go right, killing the spider and fall down the pit. Be careful of all the monsters dwelling in the Gelroid below. go left and climb down the vine. 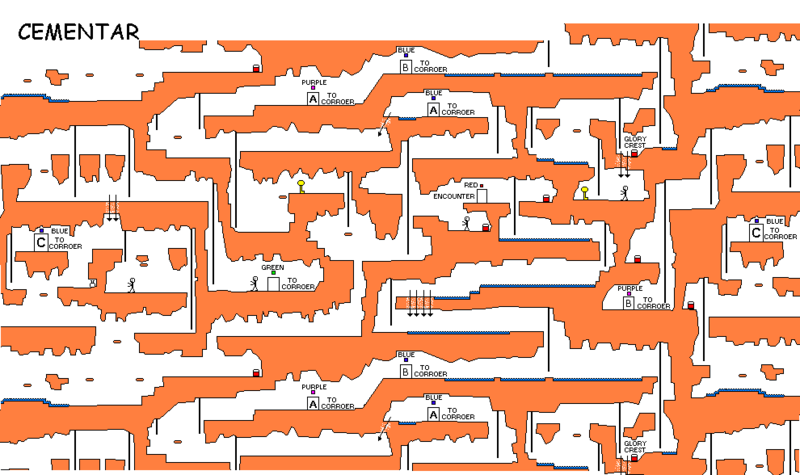 Now go right, avoiding the 2 red slime monsters in the Gelroid and climb down the vine. Now, act like tarzan and swing from one vine to the other till you reach solid ground. Open the blue door with your key and enter it. Now jump to the right and you should land on solid ground. Proceed forward and climb the vine. Now keep going left, till you reach the slope. Slide down and go through the purple. First of all eradicate that spider which is advancing towards you. Then go left and fall down. Move left, across the false ground, and enter your humble abode. Say 'No' to his offer. Haha! It's nice to have him under your control for once. Anyway you do need the Knight's Sword, so go in again and say yes. Finally you get the Knight's Sword . Go into the Weapon Shop once more and repair your shield. Then 'See your Power'. You can also chat with the townsfolk. The guy who told you about the glory crest, will be speechless. Now, you can exchange your almas now, in this town. But I would advise you to go to the 3rd town and exchange your almas there. Trust me. You won't get the sword on the next level for free! After you come back from exchanging and depositing your almas. Record your Experience and head out to increase your ever-growing crystal collection. Leave the town from the east (right) exit. Go right, and stain your new sword with that spider's blood. That sword sure is long. Okay, now fall down the pit. 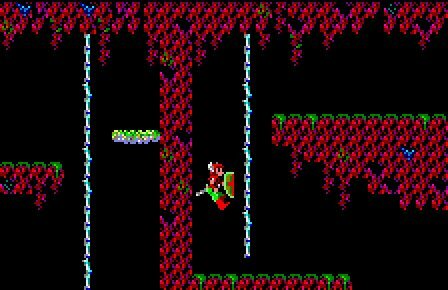 You can try and destroy the red slime monster with your sword, but all your actions will be in vain. Those things are simply too darn stubborn. You need some really powerful sword (like the almighty Sword of the Fairy Flame) to destroy these things. Right now you'll just have to settle with Lanzar. Go left and climb down the vine. Now go right, avoiding the 2 red slime monsters in the Gelroid and climb down the vine. Now, act like a knight, who loves Tarzan, and swing from one vine to the other till you reach solid ground. Go through the blue door. Keep going right till you reach the first vine. Climb it and move to the left. Destroy that large eyeball monster. This is the last you'll be seeing of him. Keep going left and climb the vine. Get off to the right. If there are any red slime monsters in sight, then eradicate them using Feugo or Lanzar because you will need to run right acroos the loose ground ahead. Okay, now keep running right until you reach the vine. Climb it. Get off to the left. Kill the spider. Jump across the red slime monster. Climb the vine. If you are thirsty have potion from the chest and enter the red door. Welcome to Vista's Home. A flying head of a fish, with a really large eyeball and a bad spitting habit. The Knight's Sword was neccessary here, because the old sword could't reach to the height of Vista. Should be fairly easy to destroy Vista. After you do so, you'll get a blue potion. Drink it and then get your beloved crystal. 5 down, 4 to go. It's time to try out your luck in the Caverns of Gold.